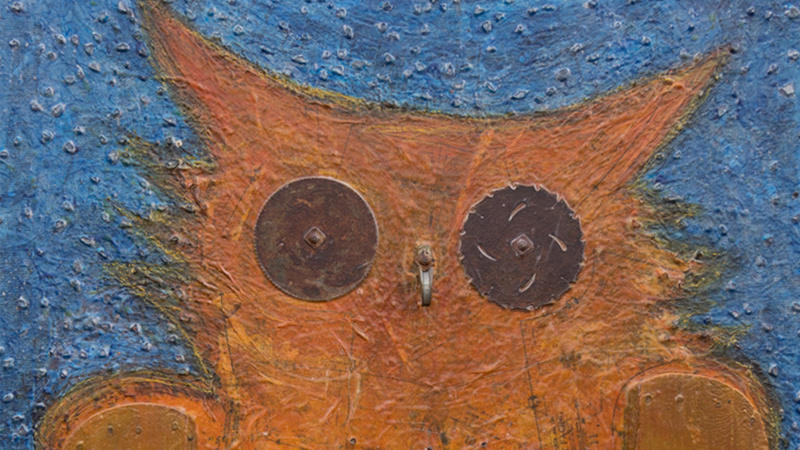 About the Piece: Rusty saw blades are her eyes. A strange metal piece becomes a beak. Her feet: garden tools. These castoffs of our own domestic activity speak to the tenacious and adaptable nature of the owl depicted in Lookout (with Owl as Witness). Our neighbor owl watches us, as she has since time before memory. Owl saw the First People passing quietly by. Saw settlers changing forest to town. She watches still. Do you hear her lonely cry in the night? Who is she calling? About the Artist: Mixed media artist Lloyd McMullen is a self-appointed savior of wayward dogs, injured birds, and homely found objects. Industrial castoffs, shards of glass, obscure rusting metal, random found objects, images, and words all serve as raw material and metaphor for two- and three-dimensional narrative paintings and constructions. These works attempt to capture a moment in time, layered in meaning. They are personal, archeological, chronological, archetypal, mythological, and confessional.